The beginning of spring is here, however the deep chill in the air would lead you to believe otherwise. The nights are still cold but the warmth of the daytime sun makes up for what the chill of the night has taken. This is an excellent opportunity to chase after some pre-spawn bass. This is a transition time of year for the lakes and ponds. A time when the water temperatures are beginning to rise and the weed growth is very sparse and small. A lake or pond goes thru this spring transition or “turn over” just as it does in the fall. The warm water is at the bottom and the cold water is at the top. During this turnover period the water begins to mix and it can create quite a mess of the water. Prior to this transition however, the bass can become quite active and feed heavily on the forage that presents itself. Being opportunistic feeders this time of year, the bass is going to take advantage of the food source that presents itself as the easiest target. As a fisherman it is your goal to locate fish and then present an offering that will trigger that fish to strike. Sometimes out of hunger but much more often out of reaction. The bait that best fits this situation is the old standby the crank bait. Most people automatically think of a crankbait as a fast moving, deep diving, rock banging type of bait. Well that is true in some aspects, but in the spring we need to remember what else crankbaits can do. When referring to crankbaits I am lumping several baits into one category. Suspending jerk baits, lipless baits, the long bill diving bait, and then your standby short fat crankbait just to name a few. You want a bait that can be worked slowly and erratically and still have good action. Rapala clacking rap Cordell Wally diver Smithwick Rouge Wiggle Wart. Color is an important factor in what you should choose. Colors such as shad, crawfish, perch, and bluegill are some of the best producers. However, sometimes you need to step outside the box a bit and use something that may attract a little bit more attention. Colors like chartreuse and blue, chartreuse and white, parrot, silver and blue, and even solid black can trigger these slow moving bass into striking. 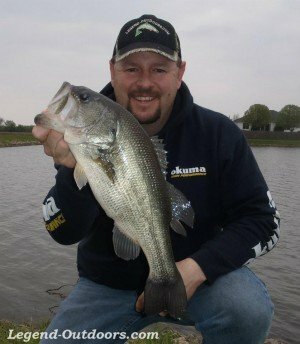 You want to offer a bait that will have the best profile under water and offer the best target for these fish. With clearer water and bright sun the darker colors often times will create a better profile. However bright colors will often out produce in the pre-dawn and dark hours. In a clear water situation the natural colors are the top producers, with the brighter colors being more productive in the darker or stained waters. The retrieve is the next key element in this ever-changing puzzle. Given the low water temperatures and the fact that the fish’s metabolism has slowed, you need to present the bait in a fashion that will offer a target to that fish over a longer period of time. Slow methodical retrieves with pauses will put a crankbait at the right depth and will keep it in the strike zone much longer. If you are using a suspending bait, a long pause that allows the bait to just hover in the water will trigger sluggish fish to strike. Make that bait just sit there and entice a fish to come investigate. The minute that bait makes a move, that bass will strike out of reaction. One of the baits I mentioned was lipless style crankbaits. These are often thought of as a fast retrieve search style bait. They do fit that category, but with some practice they can be one of the more deadly early spring baits. Using a 1/4oz bait use a lift and pause retrieve and you can work the bait just fast enough to keep it from the bottom, but slow enough that the fish can hone in on the opportunity for a meal. The heavy vibration from the rattles in these baits stimulates the lateral line of the fish. Often times if you bring that bait close enough to a bass it will strike out of instinct alone. This is commonly referred to a reaction strike. The bass saw and felt the bait and its reaction was to strike without hesitation. When you fish these areas work them thoroughly. The fish are not going to travel a long distance to hit your bait so you want to cover the areas completely to make sure that you offer your bait up in front of that bass and cause him to strike. It will take some patience to concentrate on one piece of structure, but it will certainly pay off in the end. The key is to present the bait in all possible areas to increase your odds of hooking up with a nice bass. With all the pieces of the puzzle put together now it is up to you, the angler, to take the big picture and apply it on the water. Early springtime can be a very productive time for bass, especially for those who take advantage of the action that others pass by, as many believe that the water is too cold. Now is the time for you to prove them wrong. Get out there, dust off those long rods and get back into the groove of casting and catching one of the most popular game fish in North America.